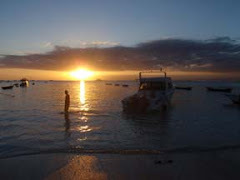 News and rambles from Nusa Lembongan: No more Scallywags - it's The Beach Club at Sandy Bay! 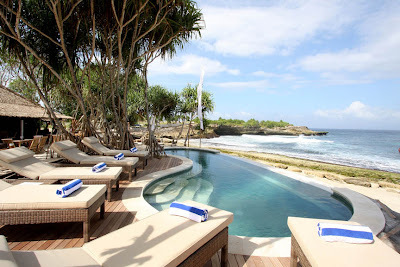 In April 2011, the best restaurant on Nusa Lembongan was re-branded and became The Beach Club at Sandy Bay. The changes evident from when it was Scallywags, are subtle but nonetheless noticeable. The menu has been streamlined a little from the over-long selection previously offered, and there are some great new additions which I tried, including an excellent Thai Red Curry. The drinks list has remained pretty much the same and they still make the best cocktails on the island by far. The owners do plan to expand the already impressive wine list. The new branding looks great and the staff are very smart in their new uniforms. All the well thought through features which has made this place such a success remain - the beach-front infinity pool, daily barbeque, air-conditioned wine cellar etc. Scallywags had rapidly become an institution on Nusa Lembongan and it is clear that in its new incarnation as The Beach Club, things will only get even better. 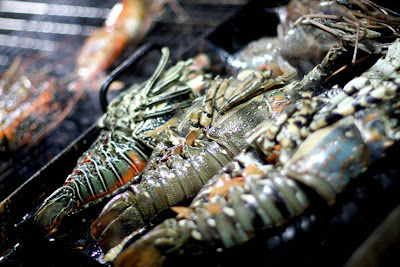 It is great for Nusa Lembongan to have a restaurant of this quality, and I urge all visitors to pay a visit. The free pick up and and drop-off service is a great idea. Give them a call to book the pick up on 0828 97005656. We visited Nusa Lembongan last summer. Wow it s really a nice island with a very relax atmosphere and smily people ! Nice place to relax , sunbathing and spend quality time. If you looking for beachfront property in front of surfing spot. The Lantana Residence offers you the best surfing spot and unique location with authentic architectural design. This Residence means to built in ecological, elegant, and luxury flavor as our purpose. The Lantana Residence will be your second home in our paradise island. Imagine when you relax in your own beautiful home that located just east of Seaside in Lombok. You feel like you are in your own paradise. You have done a commendable job with the post! Thank you for sharing it with us! My name is Joe Pinzone and I'm casting an international travel show about expats moving abroad. We'd love to film in Indonesia and wanted to know if you could help us find expats who have moved there within the last 15 months or have been there for 3-4 years, but recently moved into a new home. The show documents their move to a new country and will place the country in fabulous light. The contributors on the show would also receive monetary compensation if they are filmed. If you'd like more information, please give me a call at 212-231-7716 or skype me at joefromnyc. You can also email me at joepinzone@leopardusa.com. Looking forward to hearing from you.